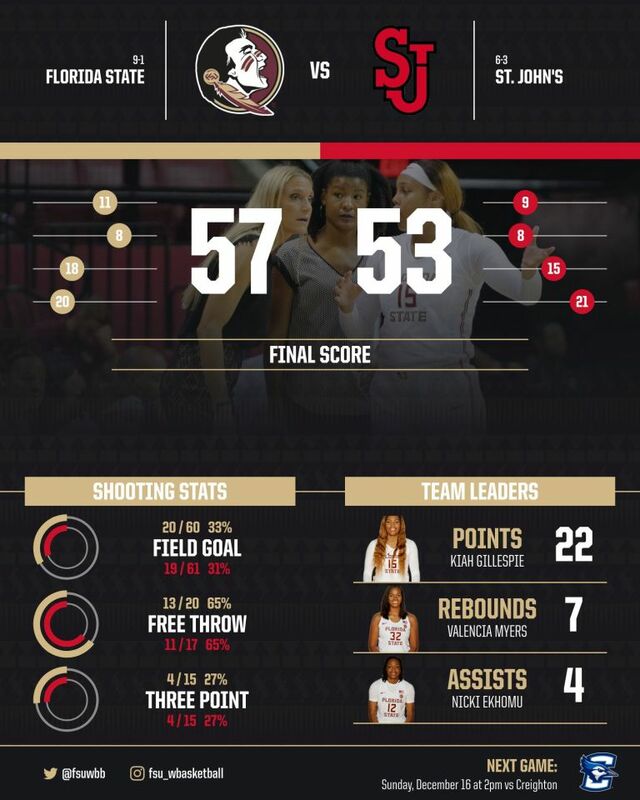 QUEENS, N.Y. (Seminoles.com) – Redshirt junior forward Kiah Gillespie delivered once again, scoring 22 points as Florida State Women’s Basketball (9-1) held off a late surge from the St. John’s Red Storm (6-3) in a 57-53 win at Carnesecca Arena. The Seminoles used a crucial 11-0 run to extend their advantage to 48-34 with 6:20 left, a run where Gillespie contributed six points. It was Gillespie’s fourth game this season with 20+ points. Entering the game, St. John’s had posted a 110-33 home record since the start of the 2009-10 season. A late run by the Red Storm brought them to within 56-53 with 16 seconds left following a 3-pointer by Alisha Kebbe. But FSU was able to execute several in-bound plays and put away the win with a Valencia Myers free throw with 12 seconds left. FSU recorded a season-high 11 blocked shots, its third-most in program history and the most recorded since totaling 11 at Minnesota on Nov. 30, 2016. Myers tied a season high with five blocks while freshman Morgan Jones added two. Jones contributed nicely on the afternoon with six points, four rebounds and two blocks in 20 minutes. Junior Nicki Ekhomu added 12 points for Florida State, which turned the ball over just 10 times. FSU held St. John’s to just 31.1 percent from the floor and out-scored it off the bench 11-2. The end of the third quarter looked to be a key momentum turner for FSU. Gillespie drilled two three-point field goals in the final 1:36 of the quarter to help FSU to a 37-32 lead going into the final period. The first half was a possession by possession battle, with both teams reigning supreme on the defensive end. The Seminoles took a 19-17 lead into the locker room, the lowest points they’ve allowed at the half this season. A mid-range jumper by Ekhomu early in the offensive set broke the tie at halftime with 20 seconds remaining. St. John’s shot just 17.9 percent from the floor in the first half, going 5-of-28 as FSU showcased excellent rotation on defense. FSU struggled as well but fared better, shooting 32.1 percent (9-of-28) as Gillespie led the way with six points. For FSU, it was the lowest it held an opponent from a shooting percentage standpoint in the first half since allowing just 17.4 percent to Western Carolina on Dec. 4, 2016.